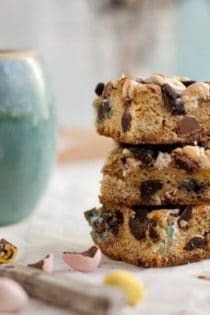 Packed with Cadbury Mini Eggs, marshmallows, and two kinds of chocolate chips, these Loaded Candy Cookie Bars will satisfy just about anyone’s sweet tooth. And if you’re anything like me, they’ll also use up the stash of seasonal candy you have lying around your kitchen. I don’t know what it is, but there is something about a seasonal candy display that draws me in like a moth to a flame. As much as I try, I simply can’t resist a 5 foot inflatable bunny rabbit peddling egg shaped candies and neon colored marshmallow chicks. It’s a weakness. These cookie bars are product of an impulse buy from last time I was sucked into the Easter Bunny’s sugary orbit. I saw a bag of Cadbury Mini Eggs (not the cream filled kind, but I love those as well) with the words ‘Royal Dark’ emblazoned across the front. Needless to say, Mr. Rabbit had my immediate attention. Seasonal shaped candies? Check. Dark Chocolate? Check. Pretty pastel colors? Check. It was a match made in chocoholic heaven. Well, I quickly snatched up 3 bags of these mini eggs (lest I run out) and happily headed home. The sensible part of me soon regretted the ‘three bag’ choice because frankly, I’m still carrying a little holiday weight (do the holiday’s ever really stop?) and having 3 bags of these little dark chocolate, candy coated eggs around the house was bound to be bad news. Luckily, because they are peanut-free, I could pawn some off on my kids (my 3 year old has a peanut allergy), but that was only going to take care of so many. The answer to my problem lay in a seriously candy packed recipe. That coupled with the fact that I have been in a completely casual and fuss free dessert mode lately, made a simple batch of cookie bars the obvious choice. The base of these bars is a fairly straight forward chocolate chip cookie but that’s where the normalcy ends. 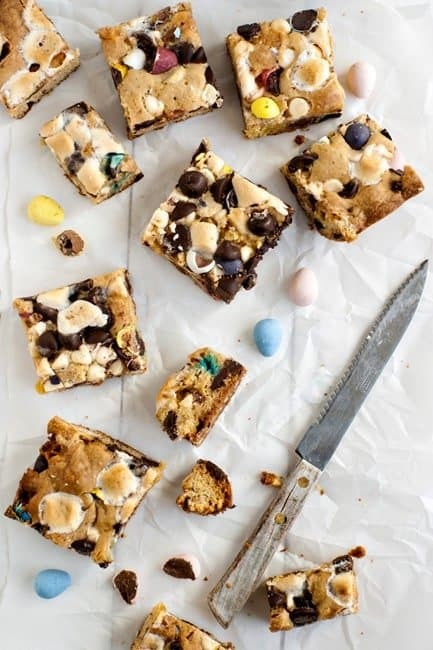 These Loaded Candy Cookie Bars are stuffed and topped with mini marshmallows, dark and white chocolate chips, as well as those Cadbury Mini Eggs that I mentioned. You could honestly use any little chocolate candy that you like in place of the Cadbury Mini Eggs. This recipe is very flexible. Go wild and experiment with your very own favorite candies. I’m sure the results will be delicious. 7. Allow the bars to cool completely before cutting. Cut into 24 bars and serve. Extra cookie bars can be stored, covered, at room temp for up 4 days. Wow…. tons ‘o stuff in these! I am sooo into these! Yum! These sound so great! Love all that chocolate! Do you think they would be okay if I left out the marshmallows? Or should I substitute something? Hi Jess! Yes, I think if you left the marshmallows out it would be fine. You could substitute (if you wanted) chopped up caramels or toffee chips perhaps. Or just increase the other mix ins if you want. Either way, leaving them put or replacing this, I think it would work just fine. Thanks so much for stopping by!! 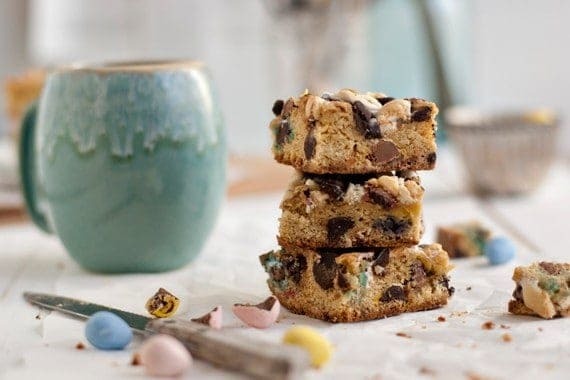 Oh yes, I’d definitely go for one of these cookie bars loaded with dark Cadbury mini eggs (no milk chocolate)! Melted marshmallows on top of cookie bars look amazing, making the bars look much lighter in color than they actually are. So Pretty! Danger danger! These look mighty good! Everything I’ve made of yours has been awesome! These were no exception. I made them for a co-workers birthday today and my whole office is on a sugar high. I did substitute the milk chocolate mini eggs for the dark and toffee chips I had on hand for the white chocolate chips, because those were what I had on hand. (I too was taken in by the 3 for, PLUS I had a coupon… and I like to eat the dark chocolate mini eggs too much to ever put them “in” anything.) One thing I found when making this – I smashed the mini eggs with the back of the knife to get them to break up a little bit before actually chopping. Mhhh, yummy! It looks soooo delicious! Must try them! I love your website, your recipes, everything you do – you’ve got talent!!!! I always love seeing what you whip up on your blog and your pictures make my mouth water. This is no exception…and I love when I get to use up my stash of random candies on baked goodies. Thanks for sharing! Can I ask why there is so much salt added? What would happen if it wasn’t added at all? Thank you! Holy cow, Em. These HAVE TO BE MADE. BTW, did anyone try to bake these in cupcake/muffin pans?